(BTO) NuDC-4U, 4 Channels DC Power Acquisition-Xtramus Technologies Co. Ltd. Besides displaying real-time power status, NuDC-4U can also record all variation of power status and export it to PC via mini-USB port. When conducting long-time tests, NuDC-4U can automatically and periodically save test logs to the folder in PC that users defined previously. 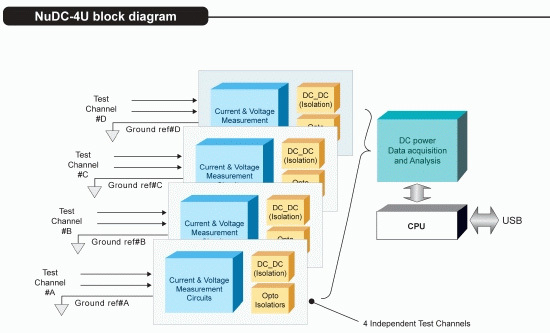 Therefore, no testing data will be lost during long testing periods, and all conditions related to the power status can be tracked down and analyzed easily. Also, NuDC-4U can send e-mails to the user-defined e-mail address whenever an error occurs, making it less likely for engineers to miss any crucial test results in a long testing time. 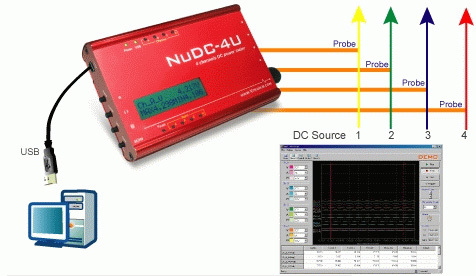 NuDC-4U has the ability to record 4,000 sample data within a second. However, in order to prevent PC crash or lag caused by the enormous data flow, users can define the Display Rate with the utility software. By defining Display Rate, users can set how many data should be sampled within 4,000 sample data generated per second. Not only preventing PCs from crashing or lagging, but this feature also provides more accurate maximum, minimum, and average values of the test. For different testing requirements, NuDC-4U also has various optional accessories available. These optional accessories include: USB interface for testing USB device power status, DC jack interface for various sizes of the DC jack connectors, PoE interface for devices support Power over Ethernet, wire connections for devices with no DC connectors, and mini daughter boards for PCB and SMD. ● Compare variation of the same test circuit design on different DUT.